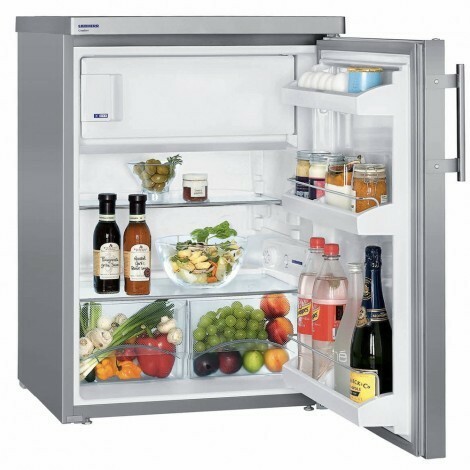 The under counter Liebherr TPESF1714 Fridge with freezer box offers you a wide range of handy features to suit all your refrigeration needs such as easy-clean vegetable bins, 2 fridge shelves with bottle and can holders and an automatic defrosting system. Transparent vegetable bins provide plenty of space for the organised storage of fruit and vegetables. In addition, they are easy to clean. Fresh food can be frozen and kept in long-term storage in the 4-star freezer compartment. Temperatures of -18 °C and lower ensure that food is stored with all the vitamins and minerals preserved. The CoolPlus function reduces the temperature in the freezer compartment for several hours so that food can be frozen gently and safely. This appliance is factory fitted with door hinges on the right. The reversible door hinges permit optimum use of the appliance wherever it is located. It has been A++ rated for energy efficiency which enables the energy consumption to be significantly reduced saving the environment and money on your bills.